Ooh look, an old school song lyric titled OOTD. Throwback! However, my face was not feeling being photographed in these photos apparently, so the focus is going to be solely on this gorgeous little striped dress from Choies*. I mentioned Choies in a previous outfit post a while back. They're an amazing website full of incredible, unique pieces. I paired this gorgeous 'fake two piece' dress with my favourite black suede wedges from ebay, that I featured in my recent giveaway. I adore this dress, it's so different to anything I've ever owned before, it's not something I'd have gone for had I have seen it on a hanger in a shop, but it looked so cool on the model (it's not on a model on the link provided, but elsewhere on the site and I saw it on lookbook.nu!!) I thought I'd just be brave and go for it! I'm so glad I did! I haven't had the chance to wear this out yet and I'm hoping I'll be able to rock it with some sheer tights and a leather jacket sometime soon, as the weather is definitely not bare leg appropriate. Does anyone else feel like it's just turned sub zero overnight here in the UK? Oh well, it's an excuse to buy a new wardrobe I suppose. Like I need one. Really adore that dress! 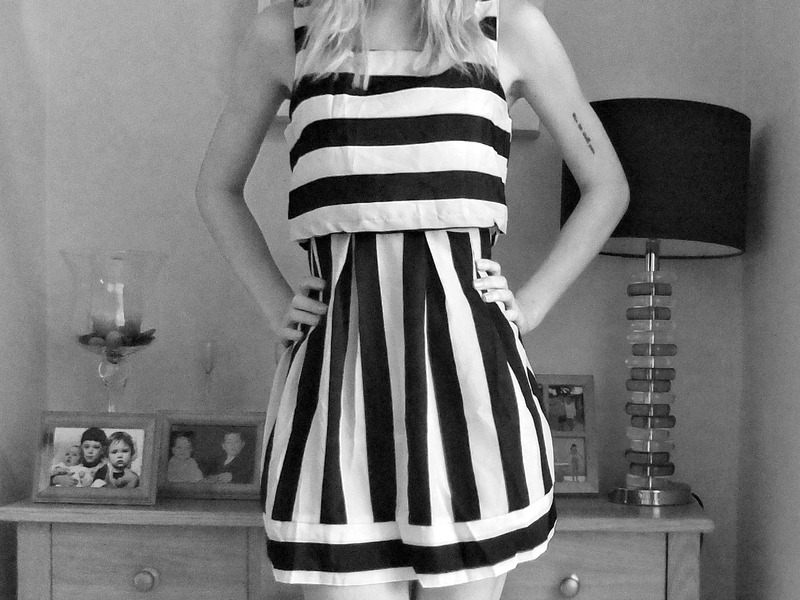 Striped attire always reminds me of a sailor (even if the strips aren't blue and white), which I am obsess with! Cute shoes too! It's definitely something I would wear, it's really pretty and I love black and white combination. 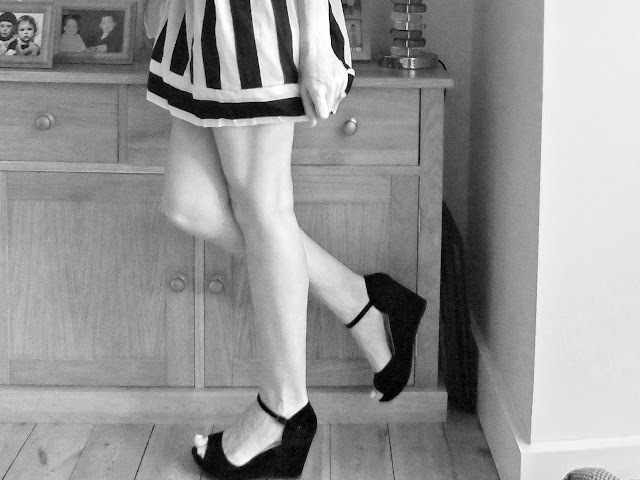 The shoes are great with this dress. 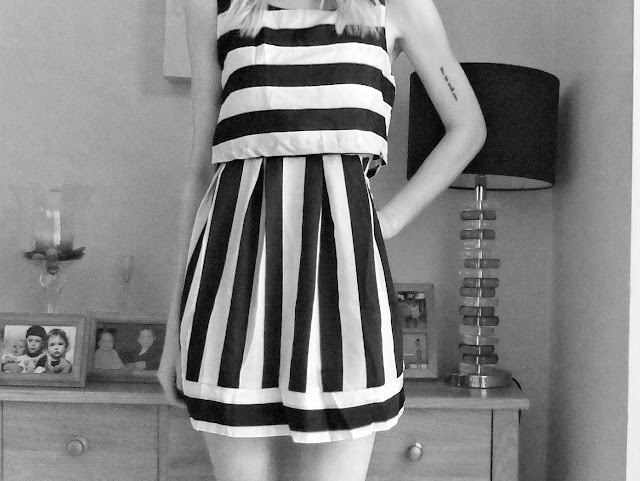 Love love love this monochrome dress! Love the monochrome look. The Black and White effect only enhances the overall look. Gorgeous! p.s having a blog re-design, would love it if you could stop by and offer any advice?